Pumpkin carving is perhaps one of the most memorable things about Halloween. Everyone remembers picking out a pumpkin at the pumpkin patch, cutting open the top and scooping out all the slimy guts. It’s lots of fun to carve pumpkins, especially if you have kids, but it’s … messy. Don’t let the potential mess scare you away from this fun holiday tradition. Follow our tips for creating terrific — and tidy! — jack-o’-lanterns! Cut a hole in the back of your pumpkin. Cutting a hole in the top of the pumpkin cuts off the stem, which provides nutrients and moisture that keep the pumpkin fresh. And because pumpkins have so much water, cutting a hole in the bottom is likely to leave you with a soggy mess. So what’s a pumpkin carver to do? Cut a hole (big enough to scoop out the innards) in the back of the pumpkin. Genius! 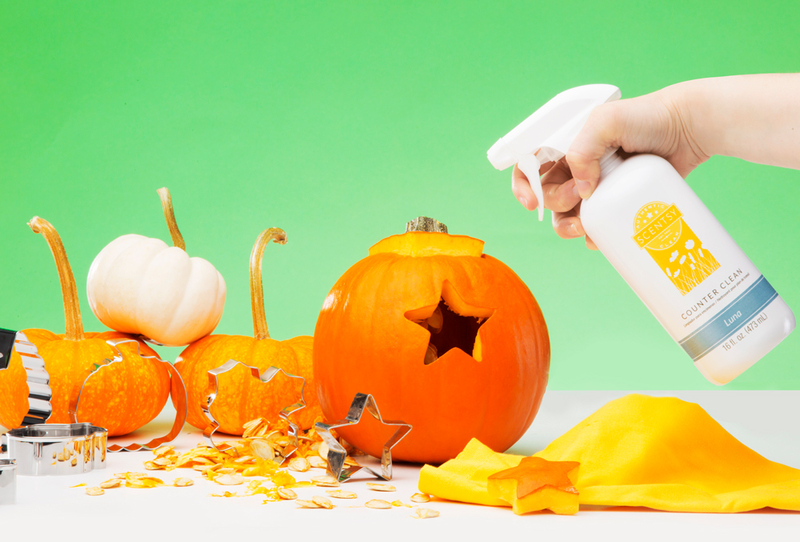 Clean out the pumpkin in your sink. A large sink in your kitchen or mudroom is ideals for cleaning out the pumpkin guts. You won’t have to worry about dropping anything on the floor, and the faucet will be close at hand when it’s time to wash up! Pro Tip: If you want to roast the pumpkin seeds, put them in a colander and separate as much pulp as you can. Then, put the seeds in a bowl of warm water. The seeds will float to the top, and you can skim them off with a slotted spoon or mesh strainer. Use an ice cream scoop to scrape out the pumpkin. It’s far more efficient and effective than those cheap plastic tools you get in a carving kit, and you probably already have one at home. Now that all the messy stuff is out of the way, you’re ready to carve your pumpkin. This is where you can get really creative: download one of our templates or get a stencil. Tape it to your pumpkin so the design won’t shift, then use a push pin or awl to poke holes along the pattern. After you’ve made an outline, you’re ready to use a carving saw to reveal your design. Pro Tip: Find fall-themed cookie cutters with simple outlines and press them into the pumpkin to create fun patterns. To prevent rotting, rinse out your pumpkin and soak it in a large bucket or tub filled with three gallons of water and three teaspoons of bleach. Soak it for two minutes, then blot it dry. 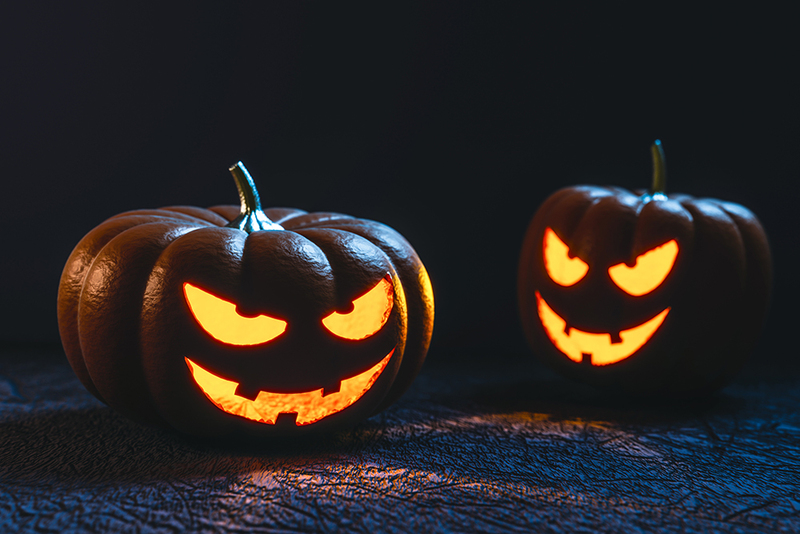 Rub the carved edges of your jack-o’-lantern with petroleum jelly to prevent them from drying out and looking wrinkly. If you follow our tips, your carving experience should be pretty easy to clean up. To banish any trace of pumpkin, give your table, sink and counters a little TLC with a quick spritz of Scentsy Clean Counter Clean. How are you carving your pumpkins this year? Share your tips and creativity in the comments below.